Brush a loaf pan ( i used 8"x 4" loaf pan) with butter or line it with parchment paper.Preheat oven to 180 Deg C.
In a bowl,combine together yeast,milk and sugar.Keep this aside for 10 to 15 minutes or until the mixture is frothy. In a large mixing bowl,whisk together all purpose flour and salt.Next add melted butter /oil and mix well using your fingers. Cover it with a clean kitchen towel ,and leave to rise in a warm place until doubled in volume for about 1 to 1 and 1/2 hours.Punch down the risen dough using your fist. 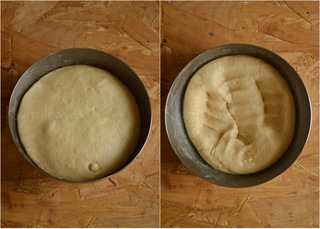 Form into a loaf shape and place in the prepared pan,seam-side down.Cover and let rise in a warm place until almost doubled in volume ,about 45 minutes. Lightly brush the top and the sides with melted butter/oil.Allow it to cool a bit before slicing. Start with 2 cups flour and slowly add more as required. (If you add too much flour the dough will be dry and the bread will turn out to be hard and dry. 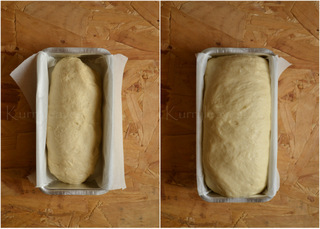 )The dough should be a bit sticky and as you knead the dough, it will be easy to handle and less sticky . 1 used 1/2 cup whole wheat flour and 1 and 3/4 cup all purpose flour. I used about 2 and 1/4 tbsp of sugar and it was moderately sweet.Adjust the sweetness according to your taste. Wow!! Looks Awesome and perfect !! 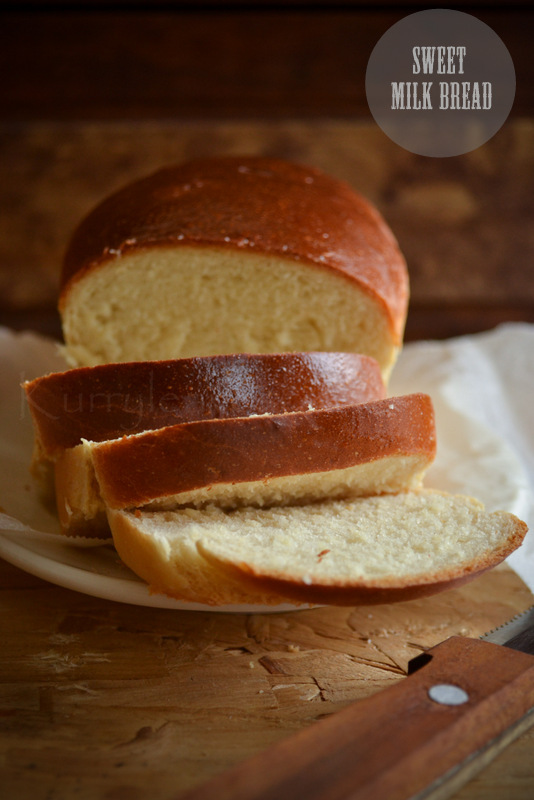 beautiful bread with such soft texture. Lovely looking bread. First time here & you have a nice blog. Once again. You make it look easy. I love sweet breads. Reminds me of the sweet bread we have with stew in Kerala. Lovely clicks as always! Your bread has the most beautiful crumb! n..thank you for the feedback. It was delicious too. This is my bread now..will make it frequently. Thanks for posting. So happy to know that you liked it...Thanks a lot for the feedback. it was really tasty..thank u..
Can I make this with a bread maker? Yes I tried it,and though it dint turn out as brown as yours,it tasted really nice!i added more sugar! My bread recipe hence forth!thank you! Hi! I tried this bread today and it turned out amazing! :D I used 1/2 tsp salt in 2 1/4 cups flour and 2 1 /4 tbsp sugar. I also had to add a bit more milk as my dough was dry; so I used a total of 1 1/8 cups of milk. Thank you for such an amazing recipe! Hey I tried ur recipe. But I had some problems.the reason must b something related to my handling the dough etc. The problem was that my bread 's crust cracked at some places and the bread had some dense grayish spots in the middle of the loaf. Please gillie me and tell me what could b the reasons and how can I overcome them. Thanks in advance. The most important part is- "KNEAD WELL for 10 to 12 minutes"...do let me know when you try it next time. Hi vidya. .I tried again today following your instructions carefully and the bread came out perfect. Only Its crust was not as brown as yours. But otherwise it was perfect..Thank you so much once again. hi I baked this bread today!! came out well . for pictures see the facebook page. 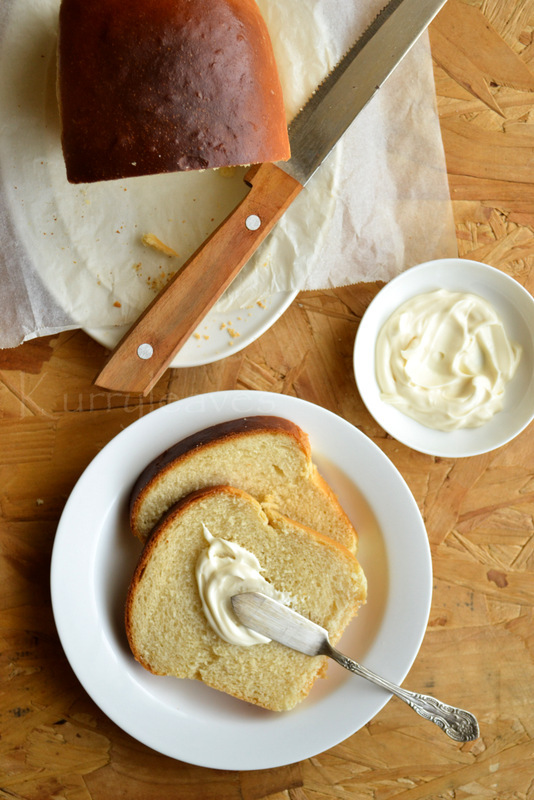 I wrote a long ode to this bread, but the post vanished when I clicked on "Preview". Oh well, let's just stick to reviewing it. I'm still eating this bread as I type, but I had to just jump in and tell you that this was Absolutely the best loaf of bread I have every baked. It rivals loaves bought from the expensive but reliable bakeries around the city; and it astonishes me that the recipe list is as short as it is. This very versatile bread has been turned into a pav-substitute and fried in butter; it has been made the sturdy vessel of a meaty salami-cheese-butter sandwich; it has even been had plain without butter or any other accompaniments. It's just so incredibly flavourful, incredibly rich, beautifully light and airy. And oh, the aroma wafting through the house! Whoever is reading this, just stop right there, and go to your kitchen and make yourself some bread. All in the pursuit of happiness, I say! THANK you, for sharing this recipe with the world! 1. I used 1/2tsp salt, 2Tbsp sugar, vegetable oil rather than butter or olive, 2 tspn yeast, milk as mentioned, and 2 cups+ 1Tbsp of flour. Don't worry if it seems to be sticky, it will come together. The less flour you use, the lighter the texture. 2. I brushed the top with milk, because I ran out of eggs. Came out beautifully brown, and moist. 3. I also kept a bowl of hot water in the oven, to generate the steam. I think that helps in promoting the moistness of the bread. 4. It's been 15hrs since I made the bread, and it's still very fresh. I wrapped it tightly in plastic wrap (cling film) before I went to bed, and as soon as it cooled; I would definitely recommend this if you're planning on baking this the night before. 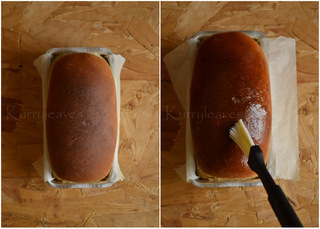 Remember to let the bread cool completely before wrapping it up! so happy that it worked well for you! Thanks Deyasini for taking the time to write a detailed feedback along with your valuable notes..i am sure this will help the readers..Thank You dear!! Kindly help me rectify...i added an extra tbsp of oil by mistake Could that be the reason? Hi ...Thank for the feedback...i guess you should bake the bread for few more minutes.that should solve the problem...also, allow the bread to cool a bit before slicing. i use a 250 ml cup..
i will update the recipe with measurements in gms as soon as possible. Hi Pavithra,I'm so sorry to hear that it didn't work for you. i guess the dough was proofed a high temperature ie the dough was over proofed. Hello: I have made this recipe 3 times now. I am using King Arthur All Purpose Flour. I tried Gold Medal Flour as well. I am unable to get the rise in the loaf. I was able to find an 8 x 4 loaf pan and got a little more lift. 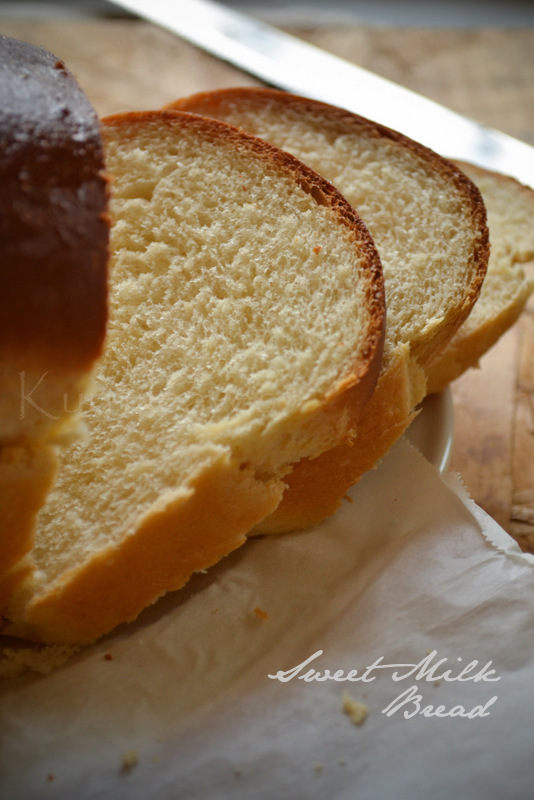 I love the idea of Milk Bread. I do get a nice froth from my yeast/milk mixture. I have made many loaves of bread but not using butter or milk and they all come out nice. I do get a 1st dough rise doubling the size but after knocking it down and letting it rise a 2nd time in the pan it will not rise in the small pan more than 1". I love the taste of this bread but my slices are VERY tiny. What can I be doing wrong? Thank you for replying. I made this recipe several times and love it. My only problem I had was with the finished loaf being too small for sandwiches. I didn't get the rise I would have liked. sooooo I modified the recipe as follows using the same ingredients. The loaf comes out beautiful using the same size pan and Gold medal AP Flour. We all love this bread. 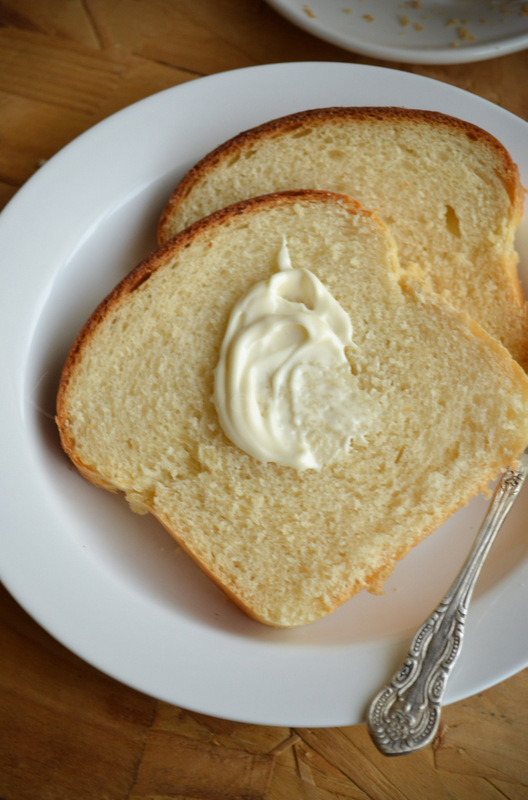 It toast up beautiful, has a wonderful crumb and just right for sandwiches. Keeps for several days. Thank you so much for the recipe as I had tried any different recipes that were tasteless. 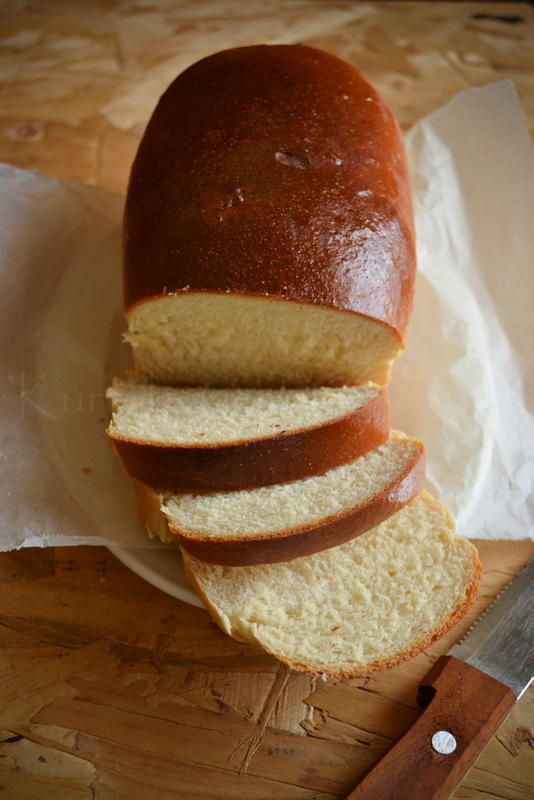 This Milk bread is the best recipe for homemade bread I have ever found in over a year of baking bread. Temperature pls? On 180° is it?